Here we are yet again with another review for the C64 crowd, a product which as of yet has not seen public release and many probably don't know of it's existence (until now!). Developed by Krzysztof, called the 'UK1541' also known as the Ultimate killer, has now been sent to us for review. It is a final design build, but many features and extras are still being worked on. But the question is, is it really the Ultimate killer? Read on and find out! Usually we jump straight into the contents but to spice it up a bit, let's take a look at the device itself. 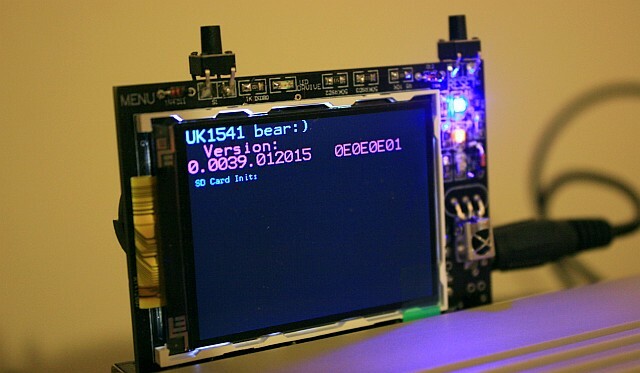 As according to Krzysztof, the UK1541 is a real time drive emulation with 6502 core instructions, and VIA’s placed into little MCU. 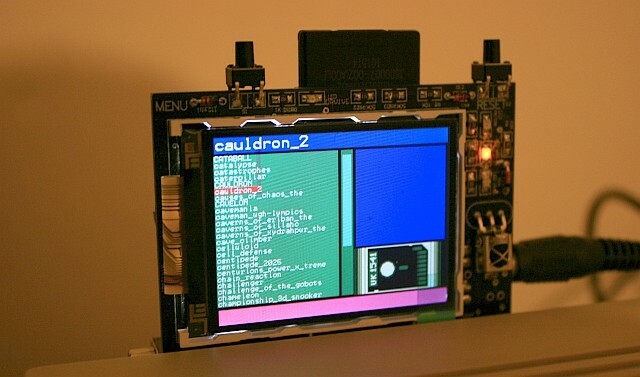 Plus LCP1114, Cortex M0, 48Mhz (0,84 DMIPS/Mhz) and User Port connection benefit of this it works with c128 in 2Mhz Mode . It also features an LCD TFT Screen 2,2", 320x240, True Colour, IR receiver for remote control, mini jack, IEC port and two buttons menu and reset. As for the LED's, top is RED drive, same function as a real 1541 drive, motor LED indicates if the motor is on or off, yellow for debugging, and lower red indicates errors and such. Pretty impressive indeed and a beauty to look at! So now we have that mouthful out the way, as per usual it's contents time. It arrived on our doorstep all nicely packaged and well put together with a serial port connection cable, IR remote, the UK1541 and two handy rubber unplug screws. There was no instructions which would've come in handy, but as this is a final version design and very new firmware, instructions will need to be done later. Before we went ahead and attached the device, I highly recommend using the unplug screws, which attach through the front and out the back into the rubbers. Don't make the same mistake I did at first and think it's screwed in from the back. Furthermore using the unplugs protects the UK1541 if you need to pull it out of the user port. So moving on, we attach the device, plugging it into the back of the user port while also attaching the serial cable into the serial port connection. Thankfully I already had an SD Card which was full of categorized games from D64's to G64's, the only thing I didn't use was a browser menu, because this device shouldn't need one. Upon correct loading we were greeted to a rather lovely menu display, which does away with the standard copying of menus from the internet. It looks colourful and bright and you don't need to load it up on the TV so again this saves time. It is also handy on those dark gaming nights. My only issue with the display so far, was the fact that the text font is incredibly small. I found it very difficult to read at about the distance from the device to sitting just slightly away from the keyboard. This could be a problem for anyone sitting at the TV screen with the C64 on the floor. The upper bar font is much better to read, as you can see below where it says 'Tape' I could read it and scroll through the listing without actually having to look at the menu itself. However I would recommend the developer increase the font if at all possible in a future firmware update. Another issue I found was the remote used to change the selections in the menu, it was extremely fiddly. There was no way of knowing which buttons did what, as the remote was probably used on another device in it's recent history. Does the volume button mount the game, or does it list? You get the idea. I believe this could be easily solved by printing tiny stickers on the remote. Thankfully I had a spare joystick and connecting it to the joystick port on the side of the UK1541 did away with all those current problems, especially if the remote runs out of power. It was also easy to list and easy to mount files! 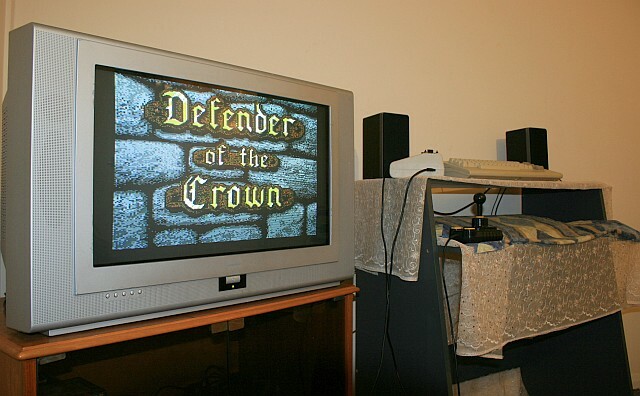 Here you can see I decided to load Defender of the Crown, and also a good test was it being a double floppy game. Can it load the game and can I mount another file? Upon moving through the menus and selecting the correct .d64 file it showed a number of details on the right hand side to say it was mounted. Then all I had to do was type Load"*",8 and then run on the C64! For some reason although it did load up, it took ages to search and load from the UK1541. Now this is most likely due to the fact that it doesn't have selectable fastload carts on board and runs at the same speed as a 1541 drive. But putting that aside the game loaded without any major issues, there was no errors and it went straight to the game screen. The LED's flashed away as to show the game was loading, which looked nice indeed. Another brilliant bonus to this device was loading up another image while in game. 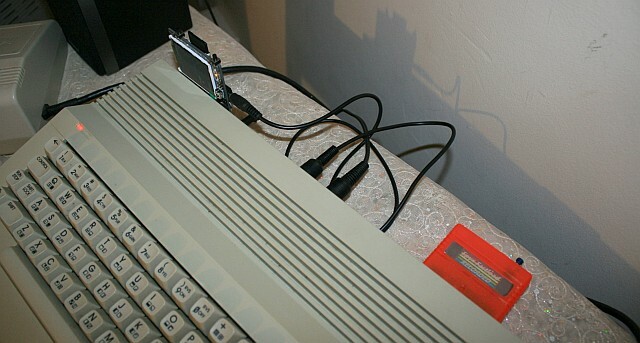 All I simply had to do was use the joystick on the UK1541 and un-mount the old file and mount the new one. The game loaded the next side/floppy and carried on as normal. Brilliant! To add to this, if the remote can be changed in some way, to make it easier to use I think this really could be a winning combination. 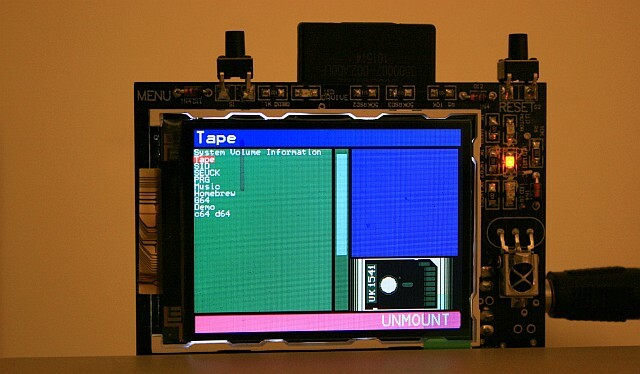 Now most people know of *.d64 files but what about tape files, *.prg's, *.g64's and all the other file types that the 1541-Ultimate can play (+Tape Adapter). Even the SD2IEC can play prg files! But no, I was pretty disappointed. Not only can the UK1541 not play tape files, which to be honest I expected as much to be fair as it doesn't have the tape adapter and nor can the SD2IEC, but the UK1541 can't mount PRG files, *.CRT or *.G64. What a huge shame and one I didn't expect coming from the Ultimate Killer. I will say this though, I have spoken to the developer and he has said that support for the PRG isn't done yet, so as this is a final build early firmware version, expect further updates down the line. Putting the negatives aside, I wanted to see if I could speed up the load times to make it a far more enjoyable experience to play demos and games. Thus with a handy EpyX Fastload Cart and a number of demos at hand, ready to play with double files, I selected the file, mounted it and got myself ready for launch. Success!! It searched and loaded way quicker, it made the UK1541 much more enjoyable to use. It even came very handy when I needed to flip the disk, just unmount and mount the next file. So simple and looks the part too in the dark. I also tried as many homebrew demos as I could find, even though that apparently don't work on the SD2IEC, do in fact work on the UK1541! What's the reason behind the (UK) name? Does it play SID tunes as I believe the Ultimate does? No, because UK1541 is 1541 device emulator only. 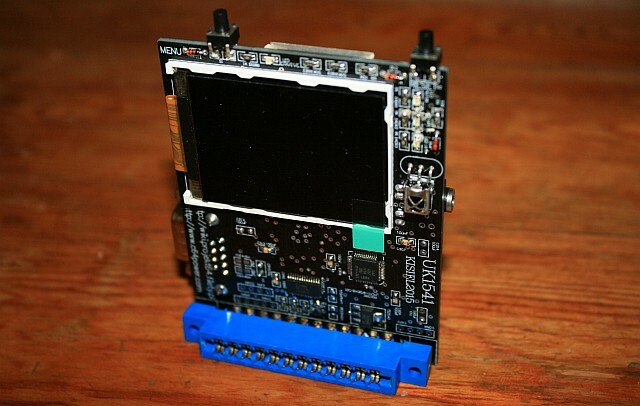 Does it have an on board audio module for audio output, such as SID emulation? No, mini jack port is for IEC, it looks like sound output but... mini jack is more compact than standard DIN connector. The price for whole unit with remote controller will take 55 Euro. Amibay, Lemon64 forum or directly from me. I can use also Ebay, but I do not have enough feedbacks to sell whole world. If everything comes in right time I will start to sell devices from 1.02.2015 in all possible ways. Do you need to download software or can you just unpack files to an SD and run them? If I understand correctly this question, what you need to do is simply unpack files to SD card (1 - 8 GB class 10 best) and that's all. I believe it doesn't play tapes or am I incorrect? No, but I think it is possible to do it with existing hardware. If it doesn't play tapes, will there be an adapter? First I need to be sure that it will work. As it uses the user port, does it have fastload? No, because UK1541 is drive emulator not all in one solution. If not, can you use an EpyX FastLoad cart and improve speeds with fastload? 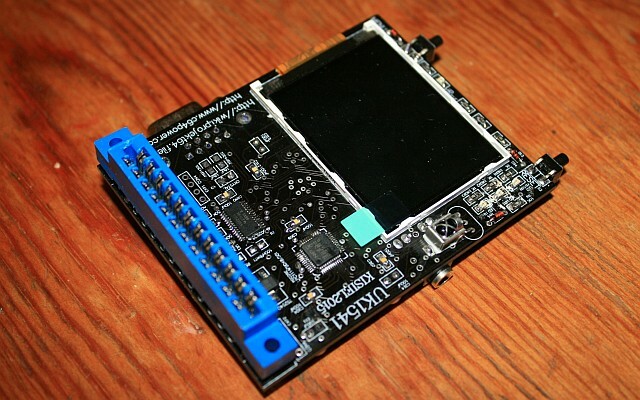 Expansion Port is free to use with Action Replay, Final Cartridge end other custom cards. Is this is a prototype? Black Edition ? No this is a representative of first batch, serial production. Is it a final version, any updates likely to come? Black Edition is compatible with Blue Edition and compatible with prototype B. In specification, software updates etc. Apart from the display, what else does this device have over any of the other devices we've tested, including the Ultimate-II? 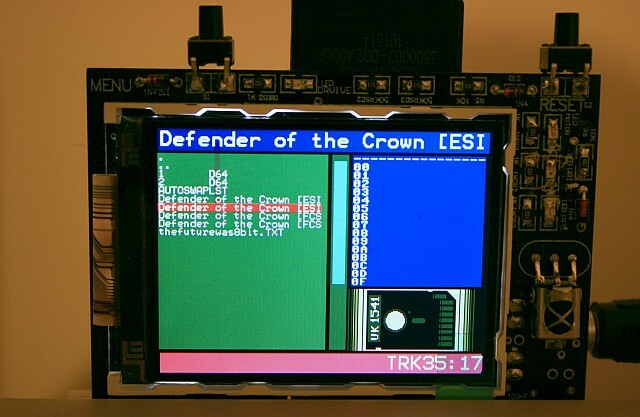 SD2IEC is a protocol emulator, UK1541 is real time hardware emulator of 1541drive. Price of UK and SD2IEC is on very close level. Ultimate II has a lot of add-ons, UK1541 has add-ons made for users, remote controller, battery supply for last accessed disk and compatibility level close to real drive 1541. How long was it in development for? I have started about 6'2012 so it took me almost 3 years to have this product on a market. I spend on project more than thousand of hours, coding , bug fixing etc. Why did you feel the need to create this device? Hmm, that is funny. 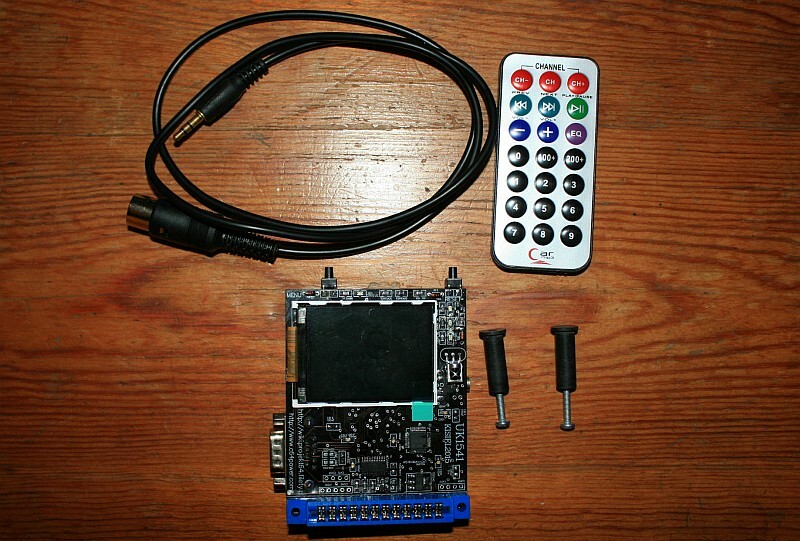 Before UK1541, I made TDC (TurboDemoBoard) a tweaker for C64 board (new version) and I sent this device to my beta tester. He checked prototype with some cards like AR, FC, GA and every thing seemed to work with TDC. One day before party when I should present my device, he finally connected Ultimate to C64 with TDC.... and then he speeded up CPU to 2Mhz computer crashed. Ultimate do not like 2Mhz ? After few weeks of testing... it was for me disaster. So I decided to do true drive emulation. 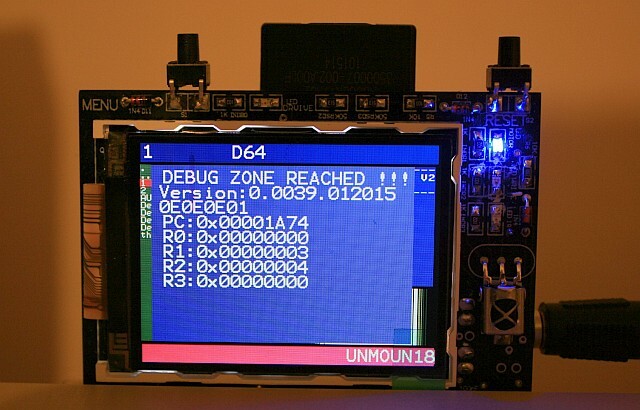 Ultimate and others emulator works on FPGA, for my point of view making something like Ultimate makes no challenge for me so I have choose cheapest Cortex on the market with CPU power on level of 40 DMIPS and I started to learn everything from beginning, assembler etc. I think for mechanic is not so bad. Anything you feel we should add that would appeal to our readers? The UK1541 is a great looking C64 product with a bright LCD screen and easy to list through the menus with a joystick attached. Certainly a looker with friends around for a gaming session! 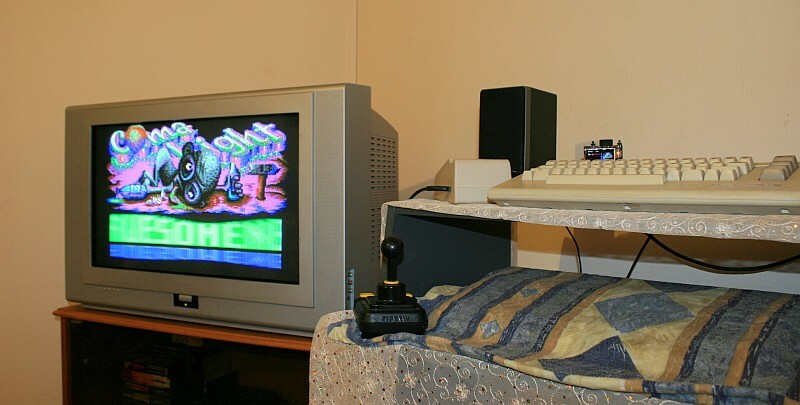 The UK1541 was also very easy to use with attached joystick to mount different files without ever having to leave the game through the TV screen (just unmount and mount). With an EpyX Fastload Cart speeds were improved dramatically and is certainly recommended when purchasing the UK1541. I was also able to play as many homebrew demos I could find, even those that didn't work on the SD2IEC. As for my negatives and it let the device down a bit too much for my liking. Classed as the Ultimate Killer, it not only could not currently mount/play *.prg files but also *.crt's or *.g64's. But do note the developer is pushing out further support soon. So expect *.prg file support and more as the product is further developed upon. As for tapes I did expect this to be honest, as even much more expensive products have tape modules attached, so I can't knock it for that. Regarding the display screen, it needs a bigger font, the screen text is way too small and anyone with any bit of eye issue would struggle to see the text. What would really help is a bigger font at the top for each selection, this with the remote having better display stickers would go a long way to a much more positive outlook. So is it worth a buy? This is a hard one for me. On the one hand I like the device with it's eye popping display screen and easy to mount control scheme. But on the other, the lack of certain file support, instructions, IR remote issue and font size is a turn off. 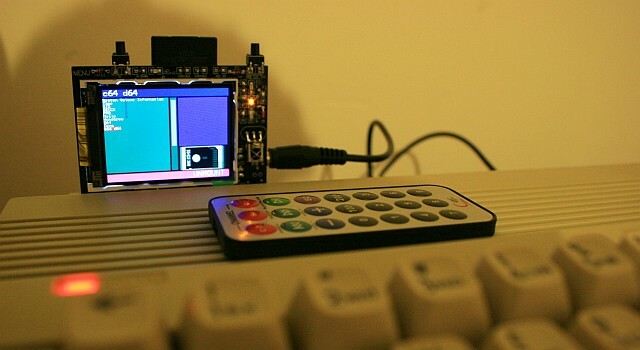 But yet you have to factor in the price here, it's far cheaper than the 1541 Ultimate-II and the C64SD and slightly cheaper than the SD2IEC while looking much more impressive to the eye and still at an early stage of firmware development. It could be a top of the line product and it certainly looks it visually. When finished and feature complete it could dominate the SD2IEC, but at the moment I put it somewhere between an SD2IEC and an C64SD (based on the display only), but nowhere near a 1541 Ultimate-II. Yet as I said it still needs work, not the device hardware, but the firmware and support. Certainly one to keep an eye on! please ping me when its ready for sale... want to be the 1st customer! awesome!